Any system that uses electrical power to produce chilled air. The chilled air is continuously passed over the food product, and in doing so, it removes heat. Mechanical freezing systems are characterized by a large capital investment, a significant ongoing preventive maintenance cost, and a sizeable permanent commitment of plant space. On the other hand, the resulting refrigeration is produced at a fraction of the consumable cost of cryogenic refrigeration. It is widely used technology and present in some form in virtually every food processing plant. In some cases, mechanical refrigeration systems tend to dehydrate, or strip moisture from that product. For some products, this is not an issue. In others, it is a major quality or yield concern. Refrigeration is the withdrawal of heat from a chamber (refrigeration load) to achieve temperatures lower than ambient temperatures. After heat is withdrawn, it is transferred to a condenser and dissipated to air or water. The purpose of refrigeration in food processing is to preserve quality and delay spoilage; in volatile organic compounds recovery, is to condense and capture harmful vapor emissions; and in the liquid natural gas industry, to facilitate natural gas storage and transportation. More than 90 percent of U.S. industrial refrigeration is provided by mechanical systems using ammonia as the refrigerant. Mechanical refrigeration units are dedicated systems, installed at individual industrial facilities and owned and operated by the industrial companies. Refrigeration is achieved when the refrigerant, circulating in the system, withdraws heat energy from the chamber to be cooled (load). Heat energy (latent heat of evaporation) is absorbed as liquid refrigerant undergoes a phase change to a gaseous state. Systems are composed of four basic elements connected with piping into a closed loop that re-circulates refrigerant. Compressors (generally) use motor-driven rotating impellers to generate gas pressure. 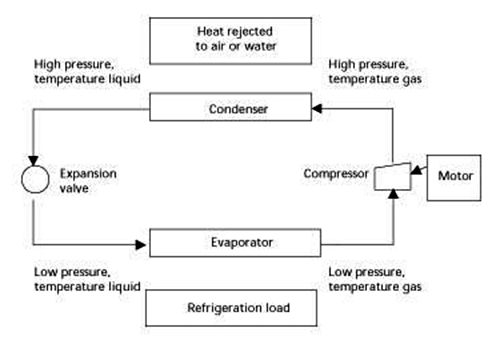 Gaseous refrigerant enters the compressor at low pressure and temperature and exits at high pressure and temperature. Inside condenser coils gaseous refrigerant condenses to liquid state. To facilitate phase change, the condenser dissipates heat energy to ambient air or water. High pressure refrigerant exits at lower temperature. An expansion valve controls the flow of high pressure liquid refrigerant to the evaporator. As refrigerant passes through the expansion valve it is further cooled by the Joule Thompson effect, the scientific principle that the temperature of a stream is reduced when forced through a narrow nozzle and allowed to expand. Inside the evaporator, liquid refrigerant vaporizes into a gaseous state. Vaporization requires heat energy, which is extracted from the industrial process load (food items to be cooled). The refrigerant is returned to the compressor to repeat the cycle. Heat exchangers are devices that transfer heat from a hot to a cold fluid. The barrier between the two fluids is a metal wall, such as that of a tube or pipe. In many engineering applications it is desirable to increase the temperature of one fluid while cooling another. This double action is economically accomplished by coils, evaporators, condensers, and coolers that may all be considered heat exchangers. Heat exchangers are designed with various flow arrangements. The concentric tubes design uses one pipe placed inside another. Cold fluid flows through the inner tube and the warm fluid in the same direction through the annular space between the outer and the inner tube. Heat is transferred from the warm fluid through the wall of the inner tube (the so-called heating surface) to the cold fluid. Concentric tube heat exchangers can also be operated in counter-flow, in which the two fluids flow in parallel but opposite directions. The shell and tube design utilizes a bundle of tubes through which one of the fluids flows. These tubes are enclosed in a shell with provisions for the other fluid to flow through the spaces between the tubes. In most designs of this type, the free fluid flows roughly perpendicular to the tubes containing the other fluid in what is known as a cross flow exchange. The plate-fin design uses metal sheets brazed together into internal channels to carry warmer fluid stream, which is to be cooled. Fins, brazed to the outside surface of these channels, facilitate faster and more efficient heat transfer to the cold fluid stream on the outside of these channels. Liquid nitrogen or liquid carbon dioxide are purchased and kept in a pressurized storage vessel. The cryogen is piped as a liquid into the freezer unit and applied directly to the product in a variety of modes depending on the cryogen, freezer type or food product. However, the cryogen is a consumable product and except in very unusual circumstances, can only be used once. Cryogenic freezing systems are characterized by a moderate capital investment, minimal preventive maintenance cost, and a smaller and more flexible commitment of plant space (cryogenic freezers can be installed or removed over a weekend). However, liquid nitrogen or liquid carbon dioxide pricing and availability vary based on the geographic location of the processor, and the cost of refrigeration purchased this way can be more than triple the cost of mechanically produced refrigeration. In contrast to mechanical freezing, cryogenic freezing tends to “crust” the outside of the product and prevent (insert pictures) excessive moisture loss. Depending on the product, this could be viewed as a quality advantage. Food product is conveyed through a bath of liquid nitrogen. It is the fastest heat transfer rate available in cryogenic freezing, but is characterized by lower cryogen efficiency rates (higher nitrogen usage) than those achieved with other types of tunnels. However, LN2 immersion freezers mated to spiral freezers (either cryogenic and mechanical) have proven to be highly effective in increasing productivity and yield (reduced dehydration costs) and preventing damage to the bottom of the food product from the spiral belt. LN2 only. Freezer Most straight belt nitrogen tunnels (the most common type) take advantage of the refrigeration value of converting liquid nitrogen to vapor (Latent Heat of vaporization, 86 BTUs per lb), and then blow the very cold vapor over and over the product in order to remove as much refrigeration as possible before exhausting the vapor from the freezer (a process known as "vapor-stripping"). Flat belt LN2 tunnels are designed so that the LN2 is sprayed on the food product at the exit end of the freezer, and the cold vapor forced back towards the entrance of the freezer. In this way, the available refrigeration in the vapor is used most efficiently. Liquid CO2 acts very differently in a freezer than liquid nitrogen. CO2 is piped to the tunnel as a high pressure liquid (300 psi), but once it exits the injection orifice, it instantaneously expands into a mixture of gas and tiny dry ice solid particles (at -109F). The dry ice solid, commonly referred to as dry ice "snow" is driven into the surface of the food product, where the heat from the food product rapidly causes the dry ice to "sublimate" or phase directly from a solid into a gas. The refrigeration effect of CO2 occurs as a result of the latent heat of sublimation (246 BTUs per lb of solid CO2 or more commonly represented as 120 BTUs per lb of liquid CO2). Where nitrogen tunnels are able to use refrigeration from both the vaporizing of liquid and warming up the vapor, CO2 tunnels are primarily designed to use refrigeration from dry ice snow sublimation. A CO2 flat belt tunnels look much the same as a convention LN2 tunnel, except that LCO2 is injected on the product immediately after it enters the tunnel and almost continuously for about 70% of the length of the tunnel. Normally nitrogen and carbon dioxide are used very similarly in a spiral freezer. Both cryogens are injected across the belt from adjacent manifolds. Both liquid nitrogen and CO2 snow particles are vaporized almost immediately, and maximum use is made of the refrigeration in the vapor form by extensive air movement from fans located primarily along the outer edges of the belt (vapor stripping). This freezer type makes highly efficient use of both cryogens. We are not an industrial gas supplier, you should consult industrial gas industry for information related to these products. We urge you to discuss all issues of safety, pricing, product supply, deliveries and business terms with your industrial gas supplier! If a decision has been made to utilize a cryogenic freezer, the next decision is to choose which cryogen to use, liquid nitrogen or carbon dioxide. * Both of these gases are available in plentiful supply throughout most of the country * Both are delivered and stored as a liquid * Both are piped to the freezer... BUT there are major differences, including manufacturing, physical properties, freezer design considerations and others. Nitrogen and carbon dioxide are always going to be available in ample supply because there are so many essential industries that use these products as critical raw materials. However, you should be aware that there are times when regional market shortages occur. Nitrogen shortages can occur when utility companies curtail energy supply to air separation plants (and many other energy intensive industries). The nitrogen supplier must either reduce their production, or be forced to buy power from another source (if available). CO2 shortages occur when by-product source plants (the ammonia plants, refineries or ethanol processors) cut back production or operations are suspended. This could happen as a result of mechanical difficulties or poor market conditions. Shortages are generally beyond the control of the industrial gas manufacturer. However, the major LN2 and CO2 producers are well aware of their vulnerability to short term production interruptions, and have extensive contingency plans. Most industrial gas companies (both nitrogen and CO2) operate from a network of overlapping plants. If one plant is impacted, there is usually product available from another. But the industrial gas supplier will incur significant costs in getting through these short term production interruptions. As part of your gas supplier selection process, and in order to understand how these issues could impact your total freezing cost, we urge you to discuss the following with your potential or existing gas supplier: 1. their supply and distribution capabilities 2. contingency plans to supply your operations in the event of shortage 3. how this will impact your cost. comparing the cost of these cryogens, it is helpful to be able to compare them in terms of cost per pound. Note: what you are really comparing is the cost of BTUs, and depending on the type freezer, The product you are freezing and the heat transfer efficiency of your system, the BTU value of these cryogens can vary. When liquid nitrogen is put in contact with the product to be frozen, it will deliver up to 86 BTUs of refrigeration immediately as it turns from a liquid into a gas. But there are still valuable BTUs in the remaining nitrogen gas. CSE designs nitrogen freezers that take advantage of this fact, so that we are able to extract the maximum amount of refrigeration from both the liquid and vapor nitrogen. of solid (dry ice) and gas, at a ratio of approximately 45% solid to 55% gas. The gas portion of this mixture has very little refrigeration value, and little attempt is made in freezer design to strip the BTUs from this vapor, but the solid CO2, commonly known as dry ice snow, has the useable BTUs. When you apply heat to carbon dioxide dry ice, it does NOT melt. It sublimates, turning directly from a solid to a gas! BTUs available from dry ice snow. BTUs available from dry ice snow.Both LCO2 and LN2 are both excellent cryogens. There are many times when the decision to choose one cryogen over another is purely an economic decision, but at other times there is a distinct processing advantage based on the physical properties of the cryogen, the nature of the product you are freezing and the type and size freezer you need.